Pale Empress brings a complete look of gothic flair and flourish to World Goth Fair. Severina is covered in lace and jewels, polished from the tip of her toes to the jewels adorning her neck. The long skirt combined with the lace adds a romantic, almost historical gothic drama to the look, making it also appeal to roleplayers. This is the look for the women who know the true meaning of drama and live the intense passion daily. Severina’s outfit is sold as separates, but they will form an absolutely stunning look from head to toe when used together. The corsets are garment layer with lola applier option. The maxi skirt is rigged mesh with an additional garment layer lace for the upper trim. The sleeves are rigged mesh with two garment layer lace trims (undershirt and gloves) and Slink hand tattoo applier option for the lower. The Medallion Jewelry includes two pieces: an unrigged mesh collar with lace covered insets. There’s a large medallion with drop beads on front and buckles at the back of the collar. A garment layer lace trim is included on the jacket layer. Also included is the medallion on a simple chain, hanging at midchest length. The sandals are unrigged mesh designed for Slink natural barefeet and include a stunning cabochon effect nail appliers for both hands and feet. All the sandals benefit Sophie Lancaster Foundation. The sleeves and the maxi skirt are rigged mesh items that move with your avatar. In addition to the five standard sizes there are also two additional ones: XS+ that provides more generous curves in the top part of base XS and M+ that has more muscles and extra curves than base M.
There’s eight colours available of each item. All items also offer a fatpack option and a demo: please try the demos before purchasing. Prices per colour: Corsets L195, Skirts L195, Sleeves L195, Medallions L195, Sandals L99. 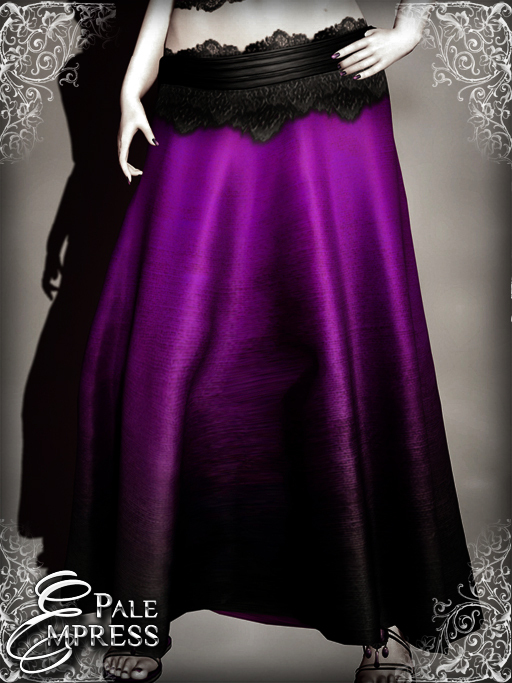 Lucrezia tops and skirts were first released in Gothmas by Gaslight and they have now arrived to both Pale Empress main store and the Marketplace for your shopping pleasure. The Lucrezia shirt gives an illusion of warmth with its long sleeves while still teasing the eye with the deliciously sheer fabric, designed to draw the wandering eye in for a closer examination. The waistband brings in structure and focus point at your waist, while the plunging neckline adds to the alluring effect. The long skirt of Lucrezia could almost be considered prim and proper if not for the curliques in it promising class. The plaid underneath adds a strong touch of attitude to the combination. Dress it up for a classy effect, or combine with a daring top for a more shocking effect. The clothes are rigged mesh items that move with your avatar. In addition to the five standard sizes there are also two additional ones: XS+ that provides more generous curves in the top part of base XS and M+ that has more muscles and extra curves than base M. Please try the demos. Permissions are M/C/NT and they are available in nine colours each. L195 per colour, L875 for the fatpack. Want to share with the world how stunning you are? Post your pictures of Pale Empress in our Flickr Group. 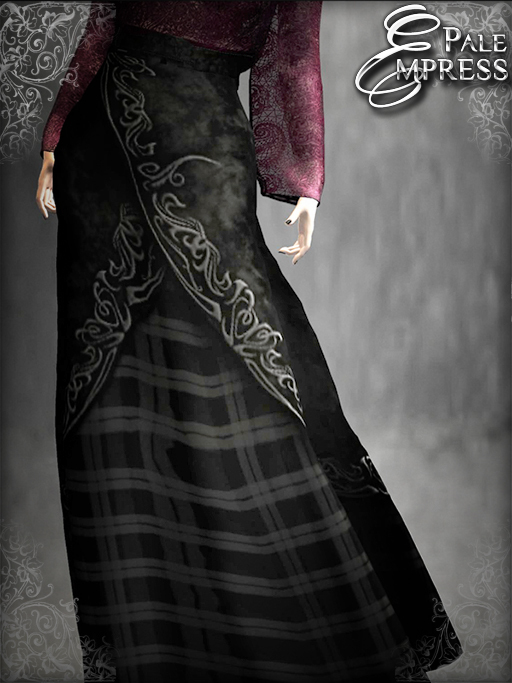 For the Lucrezia skirts there’s also the Gothmas by Gaslight flickr group. 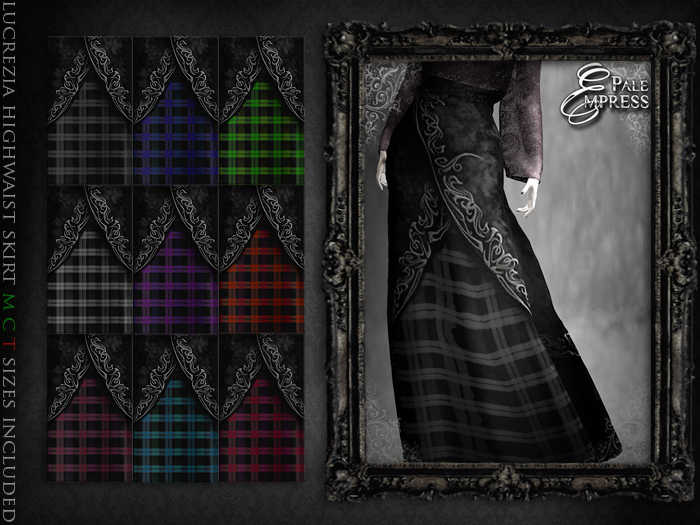 The lace chemises and plaid minis were first released in Gothmas by Gaslight and they have now arrived to both Pale Empress main store and the Marketplace for your shopping pleasure. The lace chemise is an alluring combination of sheer mesh top, backed up with garment layers underneath. There’s two garment layers included so the amount of see-through is completely up to you and how daring you might feel. The roses decorating your shoulders are separate, so you can combine them to the look or leave them out: whichever works for you. This chemise can be teasing in a classy manner or downright scandalous, depending on your whims and mood of the day. The mini skirts go perfectly with the tops if you wish to add some sassy flirt to your steps. These skirts can be dressed into full-blown punksy attitude or styled into cute mini skirt look with ease. The wide waistband keeps the skirt classy while exposing your midriff and back in a teasing manner. The mini length draws attention to your legs, the combination creating a flirty, sassy look with style. The clothes are rigged mesh items that move with your avatar. In addition to the five standard sizes there are also two additional ones: XS+ that provides more generous curves in the top part of base XS and M+ that has more muscles and extra curves than base M. Please try the demos: chemise | skirt. Want to share with the world how stunning you are? Post your pictures of Pale Empress in our Flickr Group. For these clothes there’s also the Gothmas by Gaslight flickr group. Pale Empress brings a gacha loaded with various flavors of fondness to the Spread the Love Gacha Event. The LBGTQIAP t-shirts might not roll off the tongue, but each letter is important and had to be included. After all, love is a big bowl of soup and we are all floating in it together, side by side, each flavor making the whole better and more diverse. Each gacha prize includes both men’s and women’s rigged mesh shirts in one colour: four sizes for men, seven sizes for women. There’s a demo available if you wish to try on the sizes before playing. There are six colours possible in the prizes and they are all common wins, there are no rares. Permissions for the shirts are M/NC/T. L50 per gacha pull. Visit Spread the Love Gacha Event to play the gacha! Pale Empress brings gothic separates in darkly festive tones to Gothmas by Gaslight. The lacey chemise is deliciously daring and combined with the plaid mini-skirt a real headturner. The Lucrezia skirt and top are slightly longer and warmer, although the top still teases the eye with its sheerness and the skirt’s curliques promise class with an attitude. The tops can be dressed up to bold holiday party or teased down to a more private occasion. The skirts cover the distance between sassy and classic both in length and style. 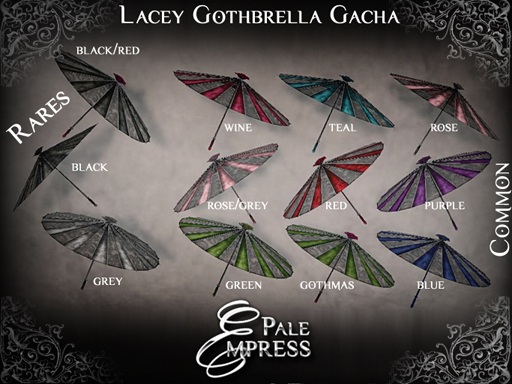 In addition to the new clothes releases, there’s also a lacey gothbrella gacha: nine commons, three rares, all wonderfully dark, whimsical and feminine at the same time. Gacha is L25 per play and the prizes are transferable. Permissions for the clothes are M/C/NT and they are available in nine colours each. L195 per colour, L875 for the fatpack. Want to share with the world how stunning you are? Post your pictures of Pale Empress in our Flickr Group. For these four there’s also the Gothmas by Gaslight flickr group. Caroline is a softer sister of Catherine’s, sharing the same shape of corsetted vest with a masculine collar that evolves into a distinctly feminine shape with a touch of whimsy on the ringleaderish coat tails. The swirled antique pattern accents mark Caroline as the more traditionally feminine one of the two, adding a touch of delicacy and romance to the look. This is the top for the women who can pull off the perfect balance between strong and soft: knowing what they want and working to get it, without compromising their own preferences for it. This is a rigged mesh item that moves with your avatar. In addition to the five standard sizes there are also two additional ones: XS+ that provides more generous curves in the top part of base XS and M+ that has more muscles and extra curves than base M. Please try the demos. Permissions are M,C,NT. L175 per color, L1050 for the fatpack, twelve colors available. 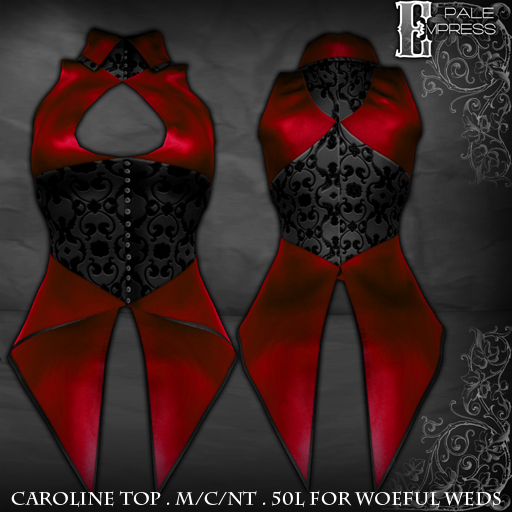 Pale Empress brings fittingly black-and-red gothic delight for your Woeful Wednesday shopping pleasure: this Caroline top will be only 50L for the duration of this Wednesday. Come indulge in the woe while the price is down! This is a rigged mesh item that moves with your avatar. In addition to the five standard sizes there are also two additional ones: XS+ that provides more generous curves in the top part of base XS and M+ that has more muscles and extra curves than base M. Please try the demo.